Giving Nature a Home in Glasgow Helping house sparrows in Glasgow - take the hedge pledge! Helping house sparrows in Glasgow - take the hedge pledge! Joe Crossland is one of our dedicated house sparrow volunteers in Glasgow. 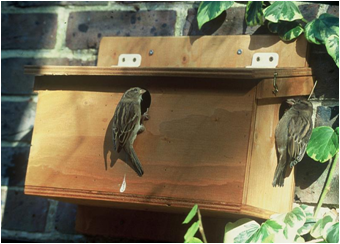 In this blog, he tells us about the project to help these birds, and what you can do to support sparrows in your own garden at home. House sparrows are in decline all over the UK, and nowhere more so than in Glasgow, where the population has fallen by up to 90% since the 1970s. A pioneering project in the city is looking to change this alarming statistic. RSPB Scotland's Giving Nature a Home in Glasgow team has joined forces with the University of Glasgow and recruited a dedicated team of citizen scientists to figure out what’s happening on the ground, and implement practical conservation techniques to reverse the decline. A team of volunteer surveyors each had their own designated plot that they monitored over the breeding season for the past three years. Early findings provided good news: house sparrows were found in all survey areas, meaning that there were existing populations which could be conserved and increased in number. Their distribution, however, was more intriguing. They were unevenly spread, clustered into distinct colonies, with some streets having sparrows at one end, but not at the other. Why was this? Assessment of the distribution and behaviour of the sparrows showed that hedges are vitally important – 85% of gardens with sparrows had high, dense cover in the form of hedges or bushes. Hedges provide a place to roost during the day, a safe place away from cats, and a place to escape if a sparrowhawk comes calling. So what’s the best type of hedge for sparrows? Research from the project has shown that it’s not the length of the hedge, nor the thickness; its height from the ground; or whether it’s continuous or broken that’s important. The most important thing is the structure of the hedge, and here’s where the lazy gardening comes in. Hedges with a loose structure (that is, those that aren’t trimmed very often) are great for sparrows. The more a hedge is trimmed, the tighter its structure becomes, making it harder for sparrows to escape quickly from predators such as sparrowhawks. Loosely-structured hedges with lots of gaps are so important to the plight of the house sparrow that RSPB Scotland is asking people to take the ‘hedge pledge’ this spring, and refrain from cutting their hedge from March until August. How’s that for lazy gardening?! It has been difficult for the team to assess the number and quality of potential nesting sites in urban gardens across the city – short of roaming around with a long ladder and poking about in every hole and crevice in the city’s houses, flats and tenements! The easiest way to make sure the birds have a safe spot to rear a brood is to provide them with one. Last year, nest boxes were installed in gardens across the city, with plans for more to be put up this year – these will continue to be monitored to establish whether nest box provision is a successful conservation measure. Surveyors monitor their patch three times a year, counting the birds in early spring, late spring, and late summer. Counting resident populations before and after the breeding season gives an indication of whether the population is increasing, and how successful the breeding season has been. Numbers increased in 2014, fell slightly in 2015 (after a very wet spring and summer), and thankfully increased again in 2016. Hopefully 2015 was a blip, and the upward trend will continue this year. 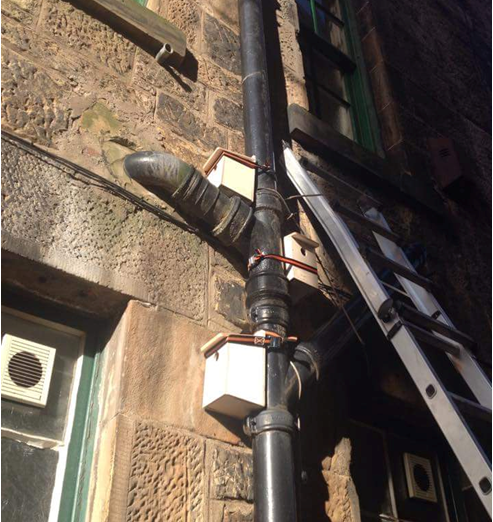 Incidentally, an ingenious recent innovation by the team has been the use of luggage straps to secure nest boxes to external drainpipes – a perfect and temporary fix for anyone not wanting or able to make changes to the fabric of their building. Many people put out food for the birds in their gardens, which, in the colder months especially, makes a real difference to urban bird populations. Careful observation has highlighted that house sparrows prefer ready access to cover – the majority have been found to feed within 1 metre of bushes – all the better for a quick getaway. So if you’re putting out food, you can increase its attractiveness to house sparrows by hanging your feeders close to a hedge (an untrimmed one at that!). Cleaning your feeders regularly will also help reduce the risk of disease. 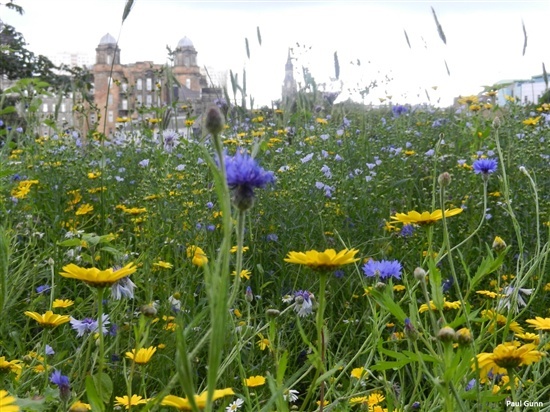 The RSPB in Glasgow has also been proactive in planting wildflower meadows throughout the city. Not only are these a beautiful sight for residents, but they do a great job of attracting tasty insects for the sparrows in the summer, and provide additional resource during the winter in the form of energy-packed seeds. If you’ve got some greenspace, let a part of your garden go wild, and throw a few wildflower seeds into the mix, and watch for the difference it’ll make. Perhaps grow some sunflowers against a fence or wall – sparrows and other garden birds will be very appreciative! House sparrows need our help if they are to recover to anything like the numbers seen a mere 40 years ago. The insights from this fantastic collaboration have yielded some very practical (and very easy) steps we can all take which will make a big difference to house sparrows in Glasgow and other cities around the UK. The more of us that get involved, the greater the impact will be – so be a lazy gardener and take the hedge pledge, give the birds a home, plant some wildflowers and put out food – but above all spread the word and encourage others to follow your lead. The RSPB Glasgow team are holding a host of up-coming activities including nest box building and wildflower meadow creation, so come along, get inspired and support your local house sparrows! For more information, or to get involved in the Glasgow house sparrow surveying project, please contact Sarah-Jayne Forster – further details on volunteering with the project can be found here.